Your herb container weather dates have not been set. They have defaulted to medium settings. Click here to set the weather dates to your area of the UK or USA. Growing herbs in containers is one of the most rewarding aspects of gardening. 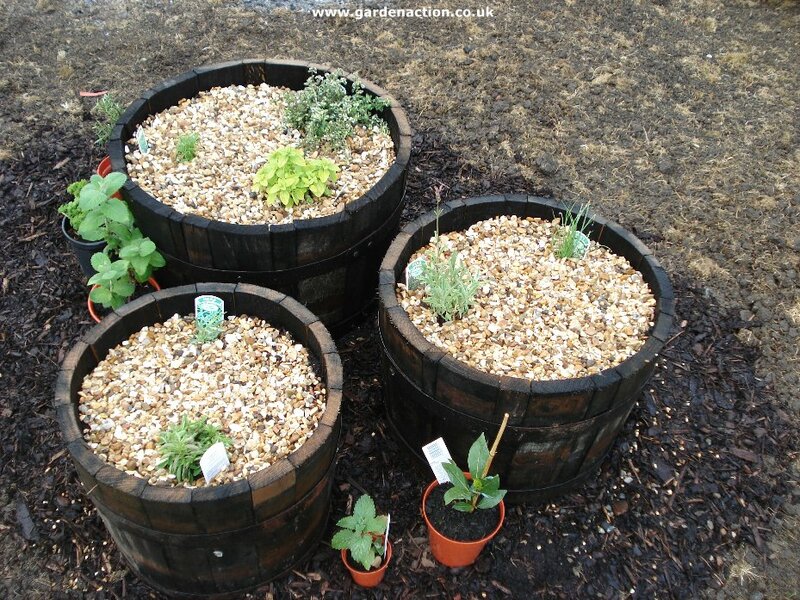 In a very small space you can easily grow six or seven different varieties of herbs. Fresh herbs taste so much better compared to dried herbs and you can pick them from your garden exactly when you need them. Many herbs are dual purpose, they provide flavour for your cooking and at the same time have decorative flowers or foliage. We started from scratch and took pictures as we went through the process. that way you know the advice you are given here comes from real practical experience. 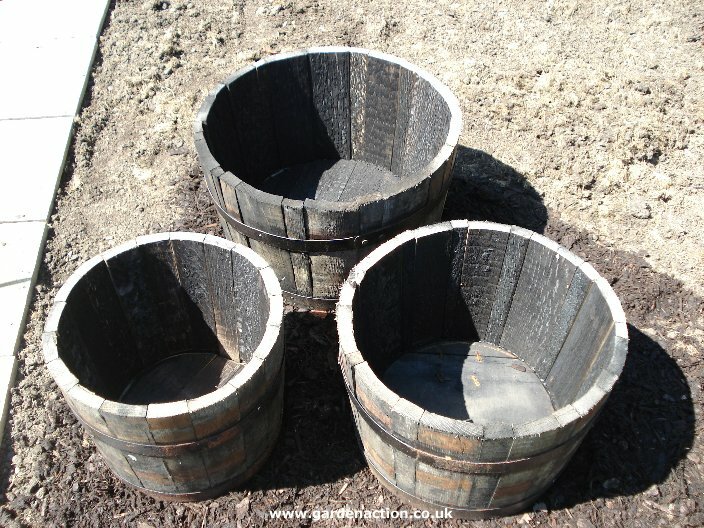 For this article we chose to grow our herbs in three wood barrels. One large, one medium and one small. But there is a huge variety of different pots which can be used. From basic plastic ones through to terracotta and metal containers. The only "must have" for any herb container is that it must have holes in the bottom for water drainage. All herbs hate growing in water-logged conditions. Many herbs prefer a period where little water is present. The containers can be any size (10cm / 4in upwards), and of course you can have as many as you want. It's also not really necessary to buy all the pots at the start, more containers can be added as your interest in herbs grows. Our aim at the start of this project was to have pots large enough for about seven herbs. If your herb container doesn't have any drainage holes in it then the first step is to make four or five smallish holes in the base. 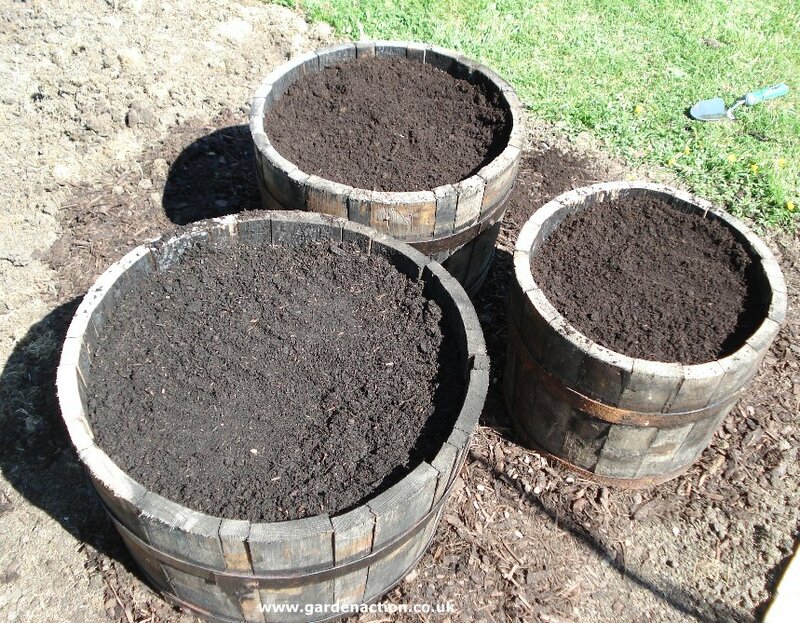 Don't make the holes to large, that would allow the compost to leak out each time the container was watered. Before you fill your container, think carefully where its final position will be. It's often best to site the container near to a house door. This will enable you to easily collect the herbs when you need them for cooking. The other factor to consider is sunlight levels. Most herbs thrive in full sun for as long as possible so site the container in full sun. Often, the drainage holes at the base of a container do not drain as quickly as you would want. With this in mind, fill the base of the herb container with small stones, crocks or clean grit to a depth of about 3cm / 1in. 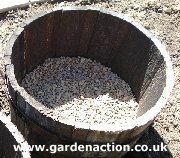 The stones / grit will allow excess water to drain through the soil / compost in the pot and out through the drainage holes in the base. Gardeners often ask which soil can be used, or is best, to fill a herb container. For a definitive answer we took a trip down to the National Herb Centre in Warmington and asked them that question. 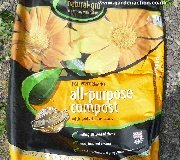 They recommended, and use themselves, good quality general purpose potting compost which has John Innes compost added to it. The picture on the left (click to enlarge it) shows the compost used at the National Centre. They are the herb experts so we recommend you use the same. 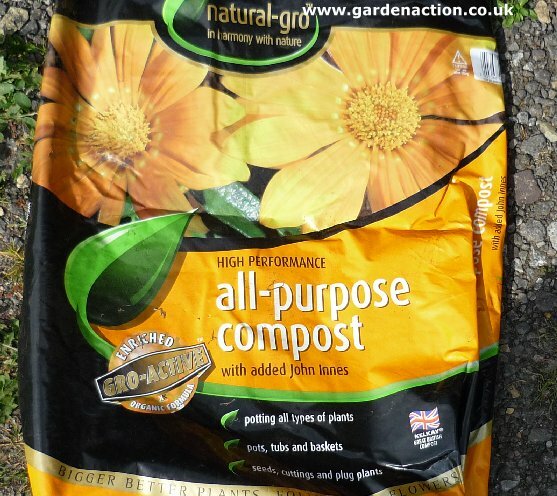 If you are unable to find any compost / John Innes premixed then simply add three parts multipurpose compost to one part John Innes. 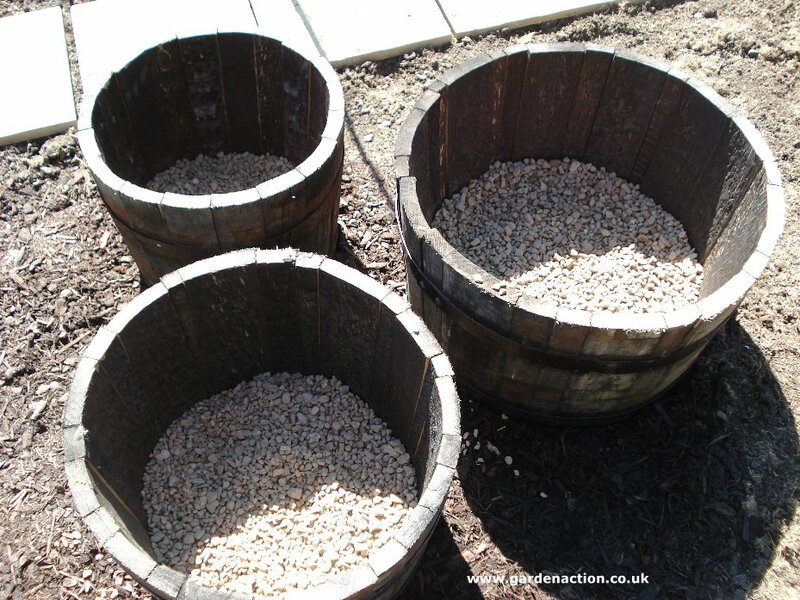 Fill the containers with the compost mix to just under the top of the container, a little less if you will be adding a final layer of gravel (see towards end of this article). As you are filling up the container, crumble any lumps of compost as you go. Your choice of herbs for the containers will depend on several factors. Is the primary purpose decorative or for cooking? Do you want one larger herb per container or two or three smaller ones. At all costs avoid planting strong growing herbs in the same container as less vigorous herbs. Mint, lemon balm and sage should be planted in containers by themselves. Slow growing varieties of rosemary were also recommended. Having bought your herbs, planting them in the filled container is easy. Scoop out a hole in the compost approximately the same size as the potted herb. Tip out the herb from the pot and place it in the hole. It should be planted to the same depth as grown in the pot. Gently firm down the surrounding soil and water in well. That's about as much as you need to do to get your container herb garden off to a good start. We added around 2cm / �in layer of gravel over the top of the compost. Not only does this make the containers look more attractive but it will also help retain moisture in warm weather, reducing the need for watering. Finally we spread a 3cm / 1in layer of chipped bark round the containers. This is purely for looks although if the containers are place directly on soil, then it will stop your feet picking up soil when you care for your herbs. To retain the chipped bark in place, we placed a low border round the area. Click the picture above to see an enlarged version with our final touches. You can water it a little, but why bother? Make a few holes with a sharp tool and you will not need to worry about waterlogging. Message: I live in Spain my basil plants keep dying the leaves get all wrinkly and go yellowish white HELP! Message: My rosemary plant is in full sun. The needles on it are turning brown. What is the cause and how can I cure it. Also, do I remove the flowers? Message: I am interested to make gardening more interesting and herb product. I am interested to make green tea but have no idea which plants are more used in makeing green tea. Message: how do I handle pooted chives in the winter? do I move them indoors? should they be left outdoors? So I have cut the stem but left some of it in with the roots attached to the earth in side the pot ..
Do you think that the stem will grow again? Do you think the basil what is left of my last plant will survive the winter in the house? I would be very gratefull if you can answer my question thank you.